"A thick, spicy sauce of garlic, olive oil, and fire-roasted tomatoes is sauteed with shrimp or your favorite seafood. Legend has it that it was named for Michele Pezza, also known as 'Fra Diablo' (Friar Devil), who helped push Napoleon's forces out of Naples. Serve the sauce over hot pasta, or, my favorite, hot couscous cooked with olive oil and garlic." Heat olive oil in a large skillet over medium-high heat. Cook and stir shallot and garlic in hot oil until tender, about 5 minutes. Add red pepper flakes; cook and stir to release flavor, about 1 minute. Stir fire-roasted tomatoes and tomato paste into the shallot mixture. Thin the sauce by stirring white wine into the mixture; cook and stir until sauce becomes thick and bubbly, 4 to 5 minutes. Reduce heat to medium-low. Add shrimp to the tomato mixture; cook and stir until shrimp are pink and cooked through, about 5 minutes. Season with parsley, basil, and black pepper. 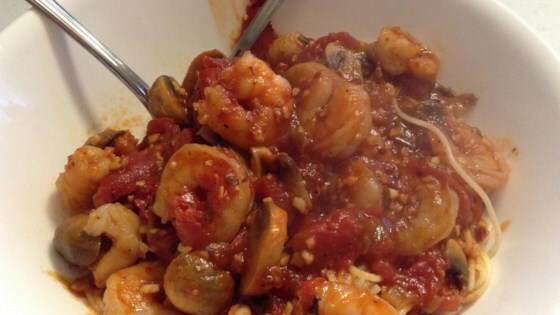 See how to make simple sauteed shrimp with spicy tomato sauce. This was really good. I served it over whole grain couscous topped with freshly grated parmesan cheese. Wow! Watch out for so much red pepper flakes - really hot! You have to like hot & spicy a lot to use so much. Start with a little bit and add to your taste. Other than than great recipe!! Easy to follow recipe. Full of flavor and not difficult to execute. I added mushrooms to mine. I made this but with chicken not shrimp. So good. Would love to try it next with shrimp. I also did not have wine so used chicken stock. Was really good. I love spicy food and so does my husband.